In my quest to produce online training classes I have been investigating some of the different types of industrial automation and PLC simulators available. My intent here is to find two different things: 1. A PLC programming simulator that is free or very low cost that can be used by students on their own computer to simulate and do exercises, and 2. A Process or Machine simulator that includes PLC and HMI programming tools and visualization of components. One of my requirements is that the software be either non-brand-specific, or multi-platform. 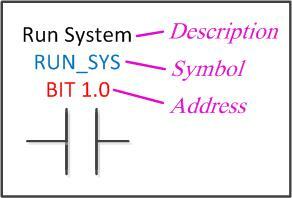 In my PLC training manual (recently published by the way), I use a generic addressing method as shown in this image. The intent is to be able to substitute any platform’s address where the red caption is, or make it invisible if using tags. The blue text could then be used either as a symbol (for non-tag-based platforms) or as a tag. All of this would need to be accessible in a list such as a symbol or tag database. This pretty much eliminates any of the major brand’s emulators, though I have been using Allen-Bradley’s RSLogix 5000 software with aliases to generic tag structures with some success. The problem with that is that it is far too expensive for students. The center image above shows a screenshot of “LogixPro”, available from The Learning Pit. I haven’t checked this out, but at only $35 it looks like a good option for those wanting to play around with Allen-Bradley’s SLC and Micrologix platform. Again, for me this is too brand-specific. It also looks like The Learning Pit kind of does what I am planning to do, online PLC training. I found a lot of other plant floor simulators when checking online. This list of simulation and modeling software on Automation World’s site had a lot of good products from Cybosoft, Mynah, Cenit and others, but they are not compatible with PLC or automation software. Last week I also participated in a demo of Famic’s Automation Studio. There are two versions of this software, the Professional Edition, and the Educational Edition. Unfortunately I don’t qualify for the Educational Edition, which would probably be less expensive than the $6000 price tag of the Professional. The demo was pretty cool. 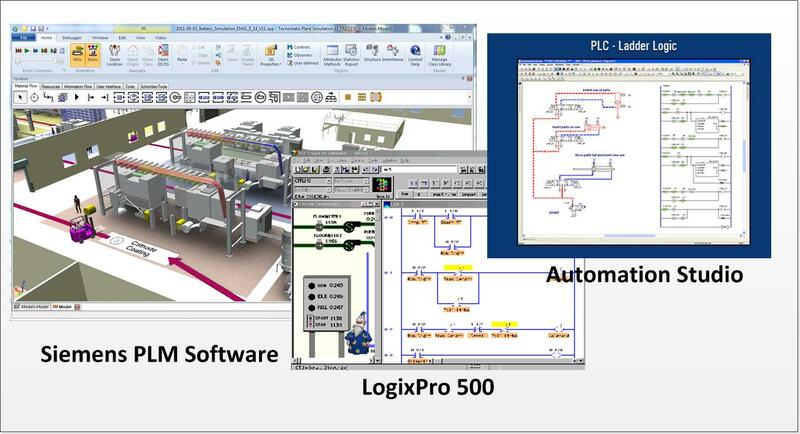 A PLC program can be written that will drive pneumatic and hydraulic circuits, which in turn can be embedded in a graphical simulation of a machine or process. The software seemed heavily oriented toward the pneumatic and hydraulic simulations, libraries of components could be imported from several manufacturers and placed into the simulation. There are drawing tools that can be used to animate the visualization, but the programmer would have to be pretty adept at creating graphics; it is not 3D. The PLC software itself is pretty basic, but it does appear to contain most of the instructions needed for training. There is also electrical circuit simulation capability. Unfortunately for me, the price is still too high to use on a per-student basis. I could buy an actual PLC, HMI and software for each student station at that price, though the pneumatics and hydraulic training capability would be nice. From what I understand, the full-blown design package is more like $20,000. I also just downloaded Factory I/O’s free trial of PLC simulation software. It is certainly more within the price range I am looking for at 695 Euro’s/seat, and it says it works with Allen-Bradley, Siemens, Modicon and CodeSys. I have 30 days to try it out and will write a bit more after I see what it can do. Overall there seems to be a lot of stuff out there, but nothing that does exactly what I want it to. I like Automation Studio’s pneumatics, hydraulics and electrical training environment, I could use something like WonderWare, Ignition or A-B’s FactoryTalk View for the visualization part, and maybe something from CodeSys or PLCOpen as a PLC platform, but there doesn’t seem to be much that combines it all together. I am also going to evaluate using a SoftPLC, but I am afraid the cost is going to be exorbitant. If anyone has any suggestions or comments let me know! Hello, Frank! Thank you for your interest in FACTORY I/O and for testing it as a potential tool for your online courses. We’d like to only mention here that 695 euros is the price of perpetual license (Ultimate Edition) but we also have a 1-year subscription model, for this edition the price is 232 euros. Since you are looking for a solution for online courses, it might be interesting for you that we offer volume discounts for perpetual licenses. Another important point is that there might be no need to use Ultimate edition if your students are learning how to work with a specific PLC brand. Siemens and Allen-Bradley editions cost 395 euros (perpetual)/132 euros (Subscription). although the WinSPS is pretty basic but its interface with Factory I/O is very easy. Factory I/O is good enough for a starter, I think. It would be very nice of you if you could post about a more advanced software which has greater capabilities.